Editor’s note: You can’t be what you can’t see. For people of color and other underrepresented minorities, seeing someone who looks like you can make you feel like you have the ability to create change at companies like Microsoft. 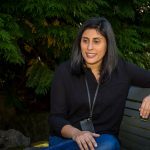 This story is part of an ongoing series about women of color and underrepresented minorities working in Microsoft Core Services Engineering and Operations (CSEO). Katina Reece knows that she can do anything, a lesson she learned when she was 6 years old, when she was asked to recite a story in church. Now Reece is a senior program manager on CloudMS Services in Core Services Engineering and Operations (CSEO), and she has carried this lesson, her Southern roots, and an ability to lead with empathy with her. Prior to Microsoft and other roles in the tech industry, she attended Mississippi State University and received an undergraduate degree in computer engineering. She went on to receive her graduate degree in electrical engineering at Virginia Tech University. There were many African American students when she began in her undergraduate program but by graduation, that number had gone down. 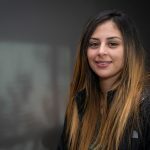 In college and beyond, she found inspiration from role models in her life who were achieving their goals. Fast forward, as she worked through a series of jobs as an engineer, technologist, and program manager that took her to places like New Jersey and Atlanta. Then Reece was recruited to work in CSEO at Microsoft headquarters in Redmond. Although this would be a big move, Reece found strength in her faith and the people around her, which have both been a consistent part of her journey. Reece’s projects in cloud governance have required collaboration across the Microsoft Azure product group, another reason Reece maintains strong relationships with all the people she works with. “We have to make sure we work with each other to make each other successful and make the project successful,” Griffin says. In her current role in CloudMS Services, she develops policies to ensure compliance with corporate standards and service level agreements. To do this, Reece works with service owners in security, storage, manageability, and data protection. To ensure that she understands the problem space, she did one-on-ones with the owners of each service area to learn their businesses, understand relative policies, and foster relationships. 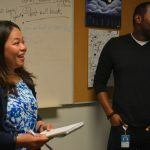 One person that she’s connected with on her team is Bryan Griffin, an engineering lead for Azure policy and governance in Cloud MS Services. Reece says that Griffin helps her understand the foundational knowledge behind the policies she’s working on. Having this understanding enables her to empower customers to control their cloud presence. Reece approaches her conversations with Griffin and other members of her team with a sense of curiosity. Reece says that as she has fostered relationships, she’s strengthened her network and the understanding of her work. Reece has passed on the support she’s received by being a mentor to individuals throughout Microsoft, and she continuously inspires people with her tenacity, ability to create community, and ongoing desire to learn. This also enables her to pass on the lessons she’s learned throughout her career. By becoming a mentor, she can a be a source of representation for other minorities and leave a legacy wherever she goes, something she attributes to being the middle child. She recalls a story when she returned to her hometown and was forgotten by her mom’s former student. Ultimately, Reece has always searched for a workplace where she is encouraged to learn and receive support from her peers, and she’s found that on her team within CSEO.